The original deadline for the kids program was June 13, but it has been extended to June 24! 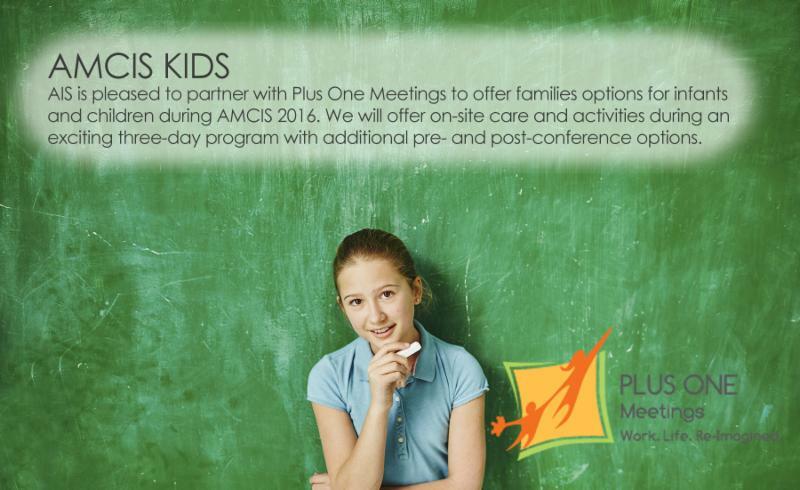 AIS is pleased to partner with Plus One Meetings to offer families options for infants and children during AMCIS 2016. They will offer on-site care and activities during an exciting three-day program with additional pre- and post-conference options. They will accept children of all ages, including infants and toddlers, pre-school, and school-aged children. The company, PlusOne, also has experience with children with disabilities. Registration Deadline and Cancellation Policy: Please register by June 13th to guarantee your place. Note: In the event that an insufficient number of children register for the program by the June 13, 2016 registration date, the program may be cancelled and, in such case, all participant fees will be refunded in full. Participants will be notified of any such cancellation on or before June 14, 2016. If the participant wishes to cancel their participation, they are entitled to a full refund if a cancellation request is received by Plus One Meetings on or before June 13, 2016. Cancellation requests received after June 13, 2016 will be refunded at 50%. No refunds are available after July 29, 2016. See Terms & Conditions on next page for full terms.